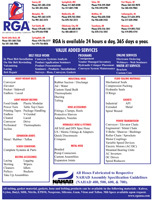 RGA is an industrial rubber distributor and fabricator. We participate in both wholesale and retail sales of hose, belting, and fluid sealing products to industrial and commercial accounts. Full stocking fabrication centers exist in Arkansas, Indiana, Mississippi, Missouri, Oklahoma, Tennessee, Texas, and Ohio. 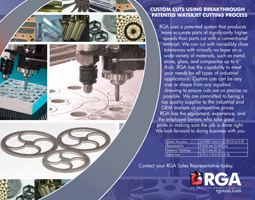 RGA is an industrial specialist in gasket cutting, belt vulcanization, hose assembly, metal hose, and expansion joint welding. We are also a full line rubber distributor. 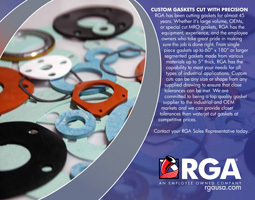 As an industrial rubber distributor and fabricator, RGA offers products and services which enhance the use of those products. We address applications for the movement or sealing of liquids, gases, chemicals, foods, and bulk materials. 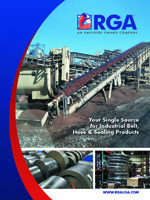 Hose, conveyor belt, drive belt, gasket, gasket material, and pump packing are available from all locations. Full sets of support lines create the flexibility to fabricate a broad range of specific systems. Conveyor belt vulcanization, gasket cutting, mechanical attachment of hose fittings and lacing, metal hose welding, testing, and certification of assemblies all lend credence to our full line capabilities. A variety of services are available to our customers in house as well as on site. Surveys and seminars are conducted to promote education and awareness of industry developments and electronic support is offered to our clientele. Click on an image below to view some of the literature we have available to better inform you of who we are and what products we offer to our customers.